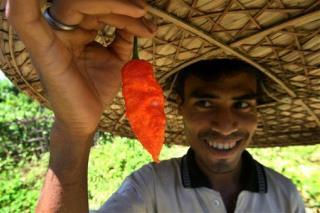 (Newser) – The ghost pepper is one of the world's hottest peppers, with a Scoville rating of more than a million. So it might follow that you shouldn't ingest it in more than tiny quantities. And yet, the Journal of Emergency Medicine reports on the unusual case of a man who tore a hole in his esophagus after eating an incredibly hot ghost pepper. The 47-year-old American ate a burger topped with a "ghost pepper puree" as part of an eating contest. YouTube is rife with video of people eating these things, so you can probably guess how this one went: The man started vomiting, profusely. He threw up so much, in fact, that he caused a tear to form in his esophagus—a rare condition known as Boerhaave syndrome. The condition has a high mortality rate, notes stuff.co.nz. ghost pepper mayo is sooooooooooooo goooooooooood!